I had a party to attend which was Disney themed. 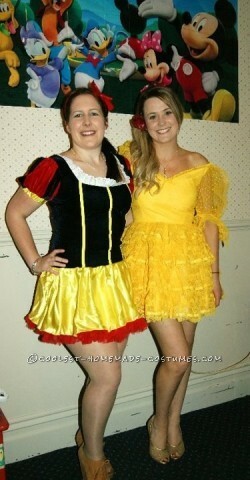 I decided to go as Belle from Beauty and the Beast. However I didn’t want to wear the long dress as none of my friends were dressing like that and it seemed a bit too formal. Instead I decided to make my dress short. I started with an old wedding dress which I cut to the desired length. My plan was to dye it but of course the material it was made out of didn’t dye so instead I bought some spray paint and spray painted it. I was slightly worried all night that I might be flammable and the dress was quite stiffed and scratchy however it looked awesome and definitely stood out. I have blonde hair so was going to spray it temporarily brown for the evening but decided against it. Instead I pulled it to the side and grabbed a red flower out of my garden and just put this in my hair. I was pretty happy with the results and it cost next to nothing to make.